Before you set your feet again in the forest for another hunting adventure, equip yourself first with the best hunting knife available in the market nowadays. Hunting had never been easier when you equip yourself with the right hunting knife. When it comes to choosing the best hunting knife, there are factors that you need to consider. First is the durability of the product. You might want to make sure that you can use the hunting knife ruggedly without worrying about its quality. The sharpness and thickness of the blade also matter as well as its comfort when handling. Today, we are going to take a look at the top 11 best bucks hunting knives. Bucks had been manufacturing quality knives over the past couple of years, with the aim to improve the performance of a hunter. Hence, whether you are still a novice or already a pro in hunting, make sure that you get yourself one. Let’s start this review with a budget-friendly hunting knife. 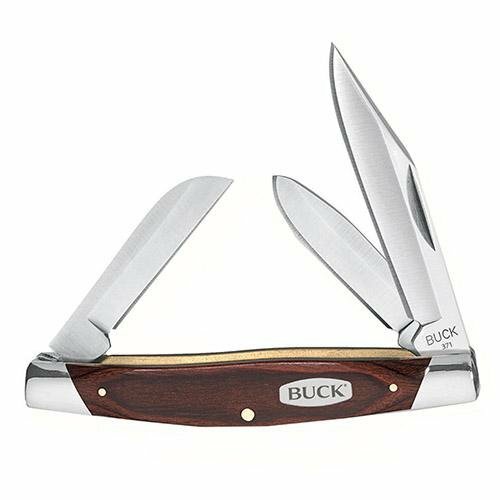 It features the traditional Buck folding system, ideal for hunters who do not like complicated knives. This solo blade pocket knife can do any essential hunting works while you’re out in the woods. The blade is made of 420 HC stainless steel that is resistant to rust and corrosion. It also features a red woodgrain handle with nickel silver bolsters for an elegant look. Since it’s made of wood, you can lessen the fatigue even when you use this knife for continuous time. The blade length is only 3 inches, allowing you to take the knife with you anywhere you want to go without difficulty. 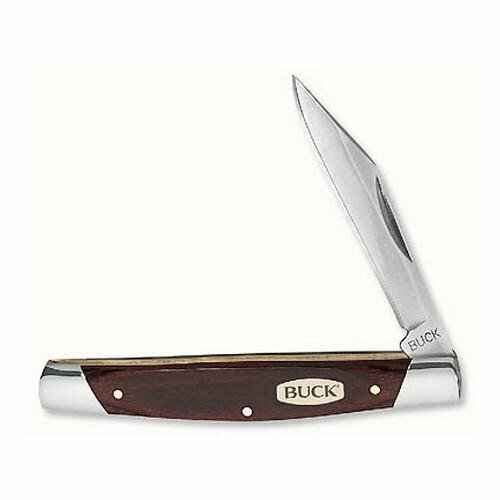 We also have the Buck Trio pocket knife. It is one of the traditional folding knives from the company, known for its durability and multi-functionality. This three-blade pocket knife features a 420HC steel clip, sheepsfoot, and spey blades. It allows you to do a variety of works while hunting. Similar to the previous product, this hunting knife also features a red woodgrain handle with nickel silver bolsters. The closed length of the product is three ¼ inches, making it easy to carry anywhere you want. If you want a hunting knife that offers multiple functionalities while making sure that it doesn’t burn a hole in your pocket, this product is for you. 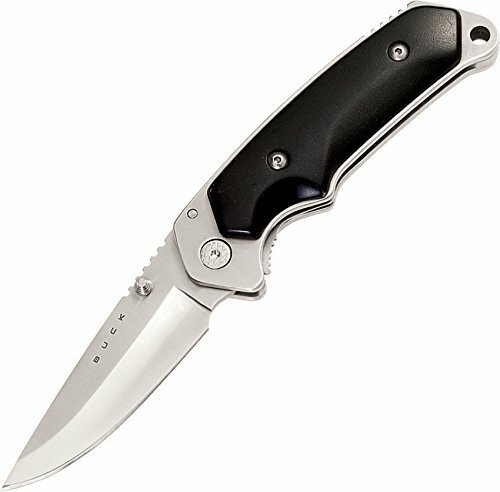 If you have extra budget, you might want to check out the Buck Knives 279 Folding Alpha Hunter Knife. It has an ultra-skinny blade that allows you to minimize the risks of puncturing while you are skinning big games. Thanks to its S30V steel blade, it will enable you to have a better edge compared to standard stainless steel you can find in the market. Also, it has a titanium-nitride coating that can enhance the blade’s resistance to rust and corrosion. Its ergonomic full-tang handle design features a smooth rosewood scales. The hunting knife’s aggressive jimping ensures that your hand is in place during the operation. The package includes a finely-crafted leather sheath, allowing you to carry your hunting knife in safety. This sleek-looking hunting knife is the Cabela’s Alaskan Guide Series Zipper Fixed-Blade that uses a full-belied, drop-point and partially-serrated blade. It also has a gut hook that delivers three vital cutting edges when it comes to dressing big game in just one hunting knife. The blade is made of S30V steel, allowing you to hold a better edge compared to other standard stainless steel in the market. It also has a checkered rubber handle that protects your hands while you are using the product. The package includes a Cordura nylon sheath, allowing you to access the knife when needed quickly. This is another budget-friendly hunting knife from Buck, the 100 folding hunter knife. It is the original lock-back hunting knife featuring Buck’s leading razor-sharp edge holding blade. It has a natural wood-stained handle, and brass bolsters to reduce the fatigue even if you use the product for a continuous period. Compared to other products in the market, the buck knife is ready to use right out of the box. The edge is long as well and re-sharpening the product is a breeze. The package includes a black leather sheath, allowing you to secure the hunting knife when not in use. Its standard 420HC martensitic stainless steel can do a variety of hunting works, making it an excellent hunting investment. The length of the blade is three ¾ inches while its closed length is 4 7/8 inches. 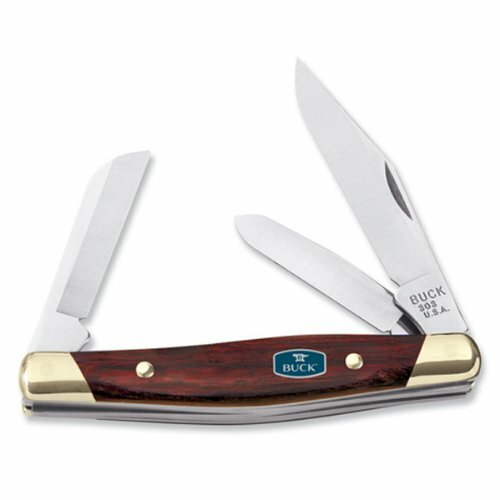 Allow us to introduce the Stockman pocket knife from the Buck. 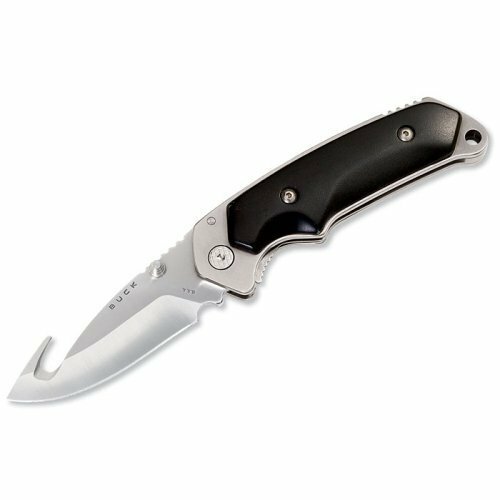 This three-blade pocket knife, similar to the previous product we’ve reviewed, features 420HC steel clip, sheepsfoot, and spey blade. It also has a red woodgrain handle with nickel silver bolsters, allowing you to hold the product for a long time without feeling uncomfortable. For those who are looking for a hunting knife that can be used in cutting ropes, skinning an elk, cleaning a fish or dressing bucks, this is the one that you are looking for. Sold at a reasonable price, you can enjoy the advantages above of the product. If you are a fan of fixed blade knives that you’d like to use for skinning big games, you might want to check the Buck Vanguard Knife. This all-purpose fixed blade field knife is superior in durability and functionality of the product. It features a hollow-ground drop point blade that allows you to do a variety of works in the forest. This hunting knife is available in textured rubber sure-grip handle, making sure that it does not slip during the operation. Or you can also buy it in a laminated cherrywood finish handle if you want a reliable and wooden handle. The package includes a quality sheath for the hunting knife’s protection when not in use. The blade length of the product is 4 1/8 inches, and its overall length is 8 ½ inches. 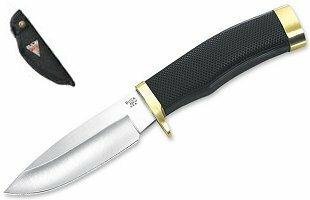 The Buck Knives 0110BKSNS1 Folding Hunter Pro Folding Hunting Knife uses a hollow-ground, clip-point blade design, allowing you to use the product in camping, hunting, or any outdoor activities. The blade is made of S30V steel that provides a better edge. In that way, you can achieve desirable results when doing the work. Also, the blade is coated with a titanium nitride coating, increasing the resistance of the blade to both rust and corrosion. You can lock open the blade using its original Buck lock-back design. The handle is made of rosewood scales that are solidly pinned between solid brass bolsters. The package includes a rugged leather sheath, making sure that it’s comfortable to carry in your belt when you go hunting. 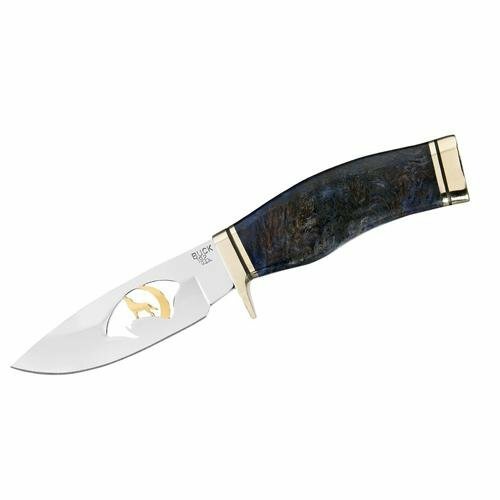 Next, we have the Buck Knives BU192BWSLE3 Golden Wolf Vanguard Fixed-Blade Knife that uses a practical drop-out blade design. If you are looking for a hunting knife that you can use for dressing big games, this is the product for you. Similar to other products we’ve reviewed, its blade is made of S30V steel, allowing you to achieve a better edge compared to other iron in the market. Its titanium-nitride coating also increases the knife’s resistance to both rust and corrosion in the long run. 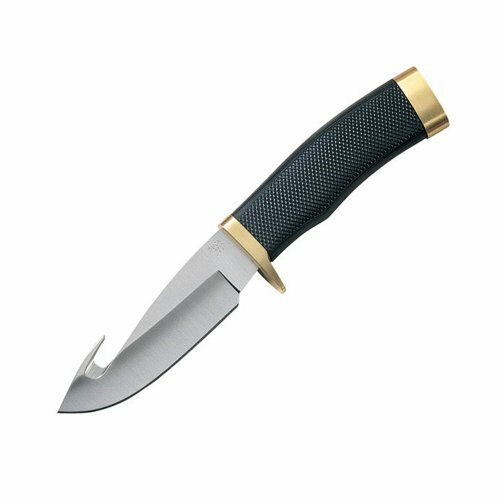 This knife features a checkered rubber handle and a brass finger guard, making sure that your hands are safe when using the product. The package includes a Cordura nylon sheath that allows you to carry the knife anywhere and access it without hassle when necessary. This is one of the best-selling knives from Buck Knives, the Cabela’s Alaskan Guide Series Alpha Hunter Fixed Blade. It features an ultra-skinny blade with a gut hook, allowing you to achieve the precise cutting edges you will need when dressing in big games. The blade is also made of S30V steel, providing an extra advantage compared to other products in the market. Its full-tang design, on the other hand, features a smoothened rosewood scale and a finger choil. It also has an aggressive jimping to ensure your hand’s safety when using the product. The package includes a crafted leather sheath that protects your hunting knife when not in use. 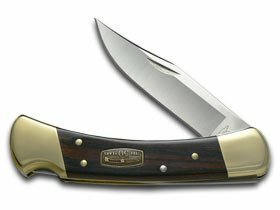 Lastly, we have the Buck Knives 0225BLS Silver Creek Large Fishing Fillet Knife. 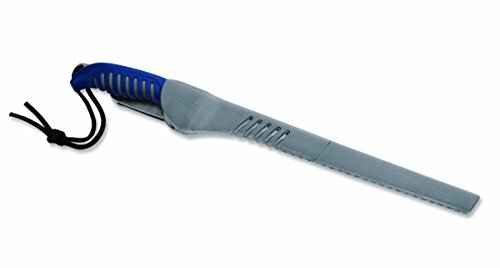 It features a thin and springy blade, allowing you to fillet fish accordingly and achieve professional results. It can also be used for boning meat. Similar to other products, the blade is also made of S30V steel, allowing you to have a better edge compared to other products. It has also been coated with a titanium-nitride coating that allows you to enhance the blade’s resistance to rust and corrosion. This hunting knife’s full-tang handle design features a smoothened rosewood scales that requires little to no cleaning maintenance. The package includes a finely made sheath to product the hunting knife when not in use.